Abuja is both a Federal Capital Territory within the nation of Nigeria and a city within that territory which serves as the nation's capital. Both were created in 1976, while the city was built throughout the 1980s. It officially became Nigeria's capital on December 12, 1991, replacing the role of the previous capital, Lagos. Abuja was as an entirely purpose-built, planned city. When Nigeria's independence from the United Kingdom necessitated a new capital city, it created not only a city, but a new Federal Capital Territory as well. The Abuja Federal Capital Territory, while smaller than other states within Nigeria, is two and half times the size of Lagos city, the former capital. This territory was formed with the express purpose of supporting Abuja city, encircling it within a womb of nature. It is, therefore, virtually impossible to speak of one as separate from the other. The site for the new capital was chosen because of its central location, easy accessibility, pleasant climate, low population density, and the availability of land for future expansion. Not only was a city designed, but an entire environment. Abuja is surrounded by abundant hills, highlands, Savannah grassland, and tropical rainforests. However, the unfortunate reality of Abuja is that the idealistic vision of the new city was not backed by solid planning. Less than 20 years after its completion, there are slums and squatters settlements in the midst of beautiful modern buildings and homes, occupied by the more fortunate. The word "Abuja" refers to both a federal capital territory within the nation of Nigeria and a city within that territory, both created in 1976. The territory is north of the confluence of the Niger and Benue Rivers. Bordering the FCT are the states of Kaduna to the northeast, Plateau to the east and south, Kogi to the southwest, and Niger to the west and northwest. It is slightly west of the center of the country. Its area covers 2,824 square miles (7,315 square km). Abuja's geography, and very character, is defined by the two renowned rock formations around it—the Zuma Rock and the Aso Rock. The Zuma Rock is called the "Gateway to Abuja," as the Federal Capital Territory begins at its base. The Aso Rock, a 400-meter monolith left by water erosion, is located at the head of Abuja city, which extends southward from the rock. Abuja has a cooler climate and less humidity than is found in Lagos. There are three seasons, including a warm, humid rainy season, from April to October, and a blistering dry season, when daytime temperatures can soar as high as 40 degrees Celsius (104 degrees Fahrenheit). Between these seasons is a brief interlude of harmattan occasioned by the north-east trade wind, with characteristic dust haze, intensified coldness and dryness. The high altitudes and undulating terrain of the territory act as moderating influence on the weather of the territory. Rainfall in the FCT reflects the territory's location on the windward side of the Jos Plateau and the zone of rising air masses. The annual total rainfall is in the range of 43.3 inches (1100 mm) to 63 inches (1600 mm). Abuja, a planned modern city, is located near the center of the territory, approximately 300 miles (480km) northeast of Lagos, the country's largest city and former capital. The city is 1180 feet (360 meters) above sea level. The city has several parks and green areas, with the largest being Millennium Park, which was designed by renowned architect Manfredi Nicoletti and was officially opened by Queen Elizabeth II of England. Magnificent buildings abound in Abuja. There is the National Mosque with its golden dome glistening in the sun, the bright pink Federal Secretariat Complex, and the Nigerian National Christian Centre. Other landmarks include the Central Bank of Nigeria headquarters, NNPC towers, Abuja International Conference Centre African Hall, Gurara Falls, Eagle Square, the National Assembly building, Abuja Stadium, the Velodrome, among others. Abuja has experienced a huge population growth, with some areas growing at 20-30 percent. As a result, squatter settlements and shanty towns have spread rapidly in and outside the city limits. The developments on the edges of the city, such as Karu, Durumi, Nyanya, and Maraba, are slums in the shadows of affluence. Many residents in these suburbs have never seen pipe-born water; their drinking water comes from either wells, hand-pumped water boreholes or even small streams used for bathing. 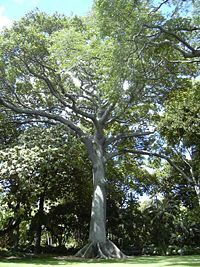 The Kapok tree, found in the shrub savanna region. The Federal Capital Territory falls within the Savannah Zone vegetation of the West African sub-region. Patches of rainforest, however, occur in the Gwagwa plains, especially in the gullied train to the south and the rugged south-eastern parts of the territory. These areas of the FCT form one of the surviving occurrences of mature forest vegetation in Nigeria. The dominant vegetation of the Territory is, however, classified into three savannah types. The Park or Grassy Savannah: This is approximately about 4,231 square km, or 53 percent, of the total area of the FCT. Vegetation occurs annually and tree species found include; Albizia, Zygia, Butyrospernum paradoxum, Anniellia, Oliveri and Parkia Clappertoniana. The Savannah Woodland: This region covers 1,026 square km, or 12.8 percent, of the territory. It occurs mostly on the Gurara, Robo and Rubochi plains and surrounding hills. Common trees found in this region include; afzelia, africana anogeissus, leiocarpus, butyroscarpus paradoxim, daniella oliveri, khaya senegalensis, prosopis africana, uapaca togoensis, albizia, zygia, vitex doniant, bombox costatum, and ptrecarpus erinaceus. The Shrub Savannah: This class of vegetation occurs extensively in rough terrain close to hills and ridges in all parts of the territory. It covers about 1,031 square km, or 12.9 percent, of the land area. Tree species found in it include: antiaris africana, anthocleista nobils, ceiba pentandra, cola gigantean, celtis spp, Chorophora excels (iroko), khaya grandifolia (Benin Mahogany) terminalia superb (afara), triplochiton scleroxylon, and dracacna arborea. Certain tree species normally associated with other parts of the rain forest in the south of Nigeria are also found in some of the forest patches, such as piptadeniatrum africanum (agboin), lophira alata (ekki), and terminalia ivorensis (idigbo). Apart from the rain forest elements, some dominant tree species of the savannah wood lands yield high quality timber, such as Anogeissus leiocarpus, daneilla oliveri, khaya senegalensis, and pterocarpus arenaceous. Since Nigeria's independence from the United Kingdom on October 1, 1960, ethnic and religious divisions required the creation of a capital city in a location deemed neutral to all parties. Also, Lagos's population boom made that city overcrowded and conditions squalid. The site for a new capital was chosen because of its central location, easy accessibility, pleasant climate, low population density, and the availability of land for future expansion. A consortium of three American firms: PRC Corporation; Wallace, McHarg, Roberts and Todd; and, Archisystems, created a master plan for Abuja. Renowned Japanese architect Kenzo Tange refined the design. Construction began in the late 1970s, but economic and political instability meant the city’s initial stages were not complete until the late 1980s. Most countries moved their embassies to Abuja while maintaining their larger former embassies as consulates in the commercial capital, Lagos. 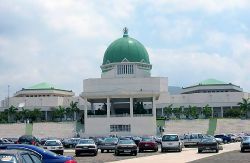 National Assembly building in Abuja. The Federal Capital Territory is a component of the 36 states and one territory that make up the Federal Republic of Nigeria's administrative system. Abuja is the location of the Presidential Complex, National Assembly, and the Supreme Court, and houses the headquarters of the Economic Community of West African States (ECOWAS), as well as its military arm, ECOMOG. It also has the regional headquarters of OPEC. The city’s phase one districts are: Abuja Central, which is the city's principal business zone and includes the National Assembly, the city hall, national cultural institutes, and other government-related offices, Garki, Wuse, Maitama, which is exclusive and is the location of European embassies, and Asokoro. Phase two districts are: Kado, Durumi, Gudu, Utako and Jabi. Phase three districts are: Mabuchi, Katampe, Wuye and Gwarimpa. There are also five suburban districts, which are Nyanya, Karu, Gwagwalada, Kubwa, and Jukwoyi. Along the airport road are clusters of satellite settlements: Lugbe, Chika, Kuchigworo and Pyakassa. Other satellite settlements are Idu (The Main Industrial Zone), Mpape, Karimu, Gwagwa, Dei-Dei (housing the International Livestock market and also International Building materials market). Agriculture in FCT produces yams, millet, maize, sorghum, and beans. Mineral resources include clay, tin, feldspar, gold, iron ore, lead, marble, and talc. Abuja's Nnamdi Azikiwe International Airport, named after Nigeria's first president, consists of an international and a domestic terminal, both sharing the same runway. In 2004, the airport served 2,232,905 passengers. Abuja city has major road connections, and has an efficient rapid bus and green cab system. Construction was underway, in 2008, for a light rail system for the city. Abuja did not have a connection to the national railway network of Nigeria. Abuja has a population of over one million. Both the city and the Federal Capital Territory have undergone a huge population growth—with some areas around Abuja growing at a rate of up to 30 percent each year. Abuja was planned as a capital where all Nigeria's ethnic groups, tribes, and religions would come together in harmony. It has avoided the violence prevalent in other parts of Nigeria, which has more than 250 ethnic groups. The population in the Federal Capital Territory include the Afo, Fulani, Gwari, Hausa, Koro, Ganagana, Gwandara, and Bassa ethnic groups. English is the official language. Other languages spoken in the territory include Hausa, Yoruba, Ibo, and Fulani. Muslims make up 50 percent of the population, Christians 40 percent, while the remainder adhere to indigenous beliefs. 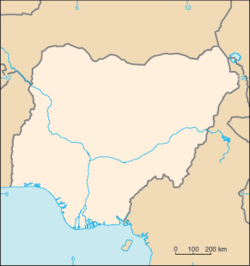 ↑ 1.0 1.1 Federal Capital Territory (Nigeria) City Population. Retrieved April 12, 2018. ↑ Jaiyeola Andrews, FCT Minister Harps on Development of Satellite Towns This Day, March 29, 2016. Retrieved April 12, 2018. ↑ Demographia World Urban Areas 14th Annual Edition, April 2018. Retrieved April 12, 2018. ↑ Senan Murray, Life of poverty in Abuja's wealth. BBC News, February 13, 2007. Retrieved April 20, 2018. Abumere SI. "The Future Population of the Federal Capital Territory, Abuja." The Nigerian Journal of Economic and Social Studies 26(3) (1984): 287-313. Elleh, Nnamdi. Abuja: The Single Most Ambitious Urban Design Project of the 20th Century. Architektur der Welt, 5. Weimar: VDG, Verlag und Datenbank für Geisteswissenschaften, 2001. ISBN 978-3897391659. Murray, Senan. Life of poverty in Abuja's wealth. BBC News, February 13, 2007. Retrieved April 20, 2018. Nigerian Road Trip: Abuja BBC News. This page was last modified on 29 January 2019, at 22:49.